Love love love! Our bus driver Bob was GREAT! He knew a lot, quite knowledgeable.He gave us 5 hours to venture off on our own. So much history in this town. Happy I took the opportunity to join this tour. Bob is the best driver by far. Awesome sauce!!!! We took the Salem Tour twice because it was so much fun and we love our tour guide Bob so much!!! He made it such a wonderful trip and his knowledge of Salem’s history is outstanding! I noticed he got a few bad reviews from around September 20-21st, and that we had to wait for a few people when it was time to leave and we waited for around 35 minutes. The real reason for that was because an older handicap woman had to use a walker so she had to Uber to a few places because it was to much to walk all over Salem, well the Uber driver didn’t know his way around and took them to the wrong place, so Bob didn’t want to leave her behind. She and her friend were in tears and were so upset about being late to the bus. Bob is such a sweet guy, nobody else minded that we had to wait for her except a few couples and an obnoxious man who were yelling at Bob to just leave her. I don’t know if they went drinking when we let off to explore or what because they were really belligerent and mean and made rude remarks to the handicap lady and her friend. 95% of the bus kept telling the belligerent people to stop yelling and to be quiet.....ALSO before we even left for our tour, Bob asked over and over if anyone needed to be back for dinner reservations or if they were in a hurry to be back because he would like to give us a little extra time in Salem, everyone agreed that that it was fine if we got back a little late. He also dropped all of us at our Hotels afterwards to make up for being back a little late. The tour was amazing and it’s a must do!!! This Tour is Not a tour of Salem. Our tour guide Bob talked more about other topics, than he did Salem. We were dropped off in Salem with about 4 hours to explore on our own, problem is most sights have scheduled tours and time frames within Salem. We only had enough time for one lunch and to see one site in Salem. Bus lost its air, it was well over 90 degrees. Bus was sickening hot. Had to stop in Lynn on the way back to Boston to Change busses. Bob couldn’t keep track of total number of customers. Never once did a head count, kept calling roll call but failed to track who had returned to bus and who had not. Right before the second stop at the birthplace of the US navy the A/C broke down. So on the hottest day of the year with 40 plus people on a bus with no windows we rode 15 min to Salem. Apparently this same bus had the same issue yesterday according to a few passengers and the driver. At the drop off the driver, Bob, said he would get a new bus. However, after 5 hours Bob picked us up on the same bus, still with NO A/C. On the positive side Salem is an interesting day trip with lots of witch themed stores. The dungeon play was great. Bob’s stories tended to be about him and his family, but I didn’t think they were as bad as other reviewers. All in all, go to Salem for a day, but maybe skip this tour company. OMG!!! Worst bus tour ever. Got on this bus at 9am and didn't get back till close to 8pm. This tour was supposed to only be 7 hours and ended up being 11 hours. We had to listen to Bob, the bus driver, go on and on about his life, his childhood, how he used to drive for a baseball team, every famous person he ever met, where he drove them to, what hotel they stayed at and all his favorite sports teams! I heard about everything, except what I came for. An actual tour about the history of Boston and Salem!!! He decided on the way back to drive to Chelsea, MA and take people to their hotel, then he stopped in East Boston to drop someone at their door, then drove someone else to the No Name Restaurant. This one hour ride back to town dragged on for three hours! For goodness sake, don't take this tour. It will be 11 hours of your life you will never get back!!! BOB the tour guide was outstanding. He was so very nice and accommodating. On route to Salem, he took us out to Marblehead Neck which was so beautiful. His local perspective and historical knowledge made the trip better than expected. On the downside, Salem is super touristy and almost every site required a tour with set times for entry. This made it hard to see a lot in the short time afforded by the bus tour. Other than that, fun place to visit with interesting history. Bob, our guide, was great! The Nathaniel Hawthorne House was very interesting and our guide provided us with lots of information concerning the site. The Salem Witch Museum and Dungeon seemed to be designed more for kids than adults. This was a great tour overall. Bob was our driver and he is great. The one thing I would change is to have more free time in Salem. We didn't have enough time to visit the Witch Museum. 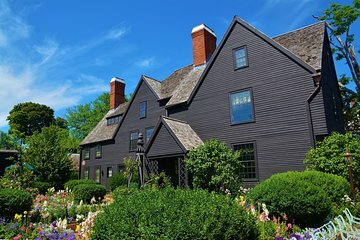 The tour should accommodate more time in the actual city of Salem.